On Jan 26th Terry Bressi and Mike Read using the Spacewatch 1.8-m reflector discovered 2006 BV39, confirmed 15 hours later from Klet Observatory in the Czech Republic. It was about 4 lunar distances away from Earth at discovery, mag +19.5, moving at 14"/min and was closing in fast. In a conversation with Monty Robson at 932 (John J. McCarthy Observatory in Connecticut) on the morning of Jan 27th I mentioned that 2006 BV39 would be an interesting target the next night (when it would be very close to Earth). Later that day, nowhere had reported it to the Minor Planet Center after the confirmation from Klet and by the time images were being taken at midnight on Jan 28th from Great Shefford the uncertainty of the ephemeris was quite large and it was not found on the images. On checking with Monty, he mentioned that he had got it the night before but had not reduced the astrometry yet. He kindly measured the positions immediately and sent them through to Great Shefford, allowing the ephemeris to be updated and that was good enough to locate the NEO during its very close approach to Earth. It was 23' W of the MPC's prediction when recovered and would have been very difficult to find without the ephemeris correction. By this time it was moving at 210"/min and was just 5,000 miles outside the Moon's orbit. It was followed at Great Shefford until 05:14UT on the 29th by which time it had accelerated to 277"/min and had crossed 28,000 miles inside the Moon's orbit with closest approach about 2 hours later at 0.877 Lunar distances. This was the third NEO tracked from Great Shefford while inside the Moon's orbit in four months! (See 2005 UW5 and 2005 WN3). All three appear in this diagram of the handful of NEOs with well defined orbits that have been observed while closer to the Earth than the Moon. 2006 BV39 is very small and with an absolute magnitude of +29.0 is estimated to be between just 4 and 9 meters in diameter. With such a small object, large variations of brightness can result if the object is irregularly shaped and if spinning fast can result in large variations of magnitude in short periods of time. This appears to be the case with 2006 BV39, where it can be seen to peak at a magnitude of +16.8 in frame 2, then fade at least 1.8 magnitudes within 86 seconds so as to be virtually invisible by the last frame in the animation below. Each frame keeps the NEO centered in the field of view and is the result of stacking 9 x 1 second exposures together (with a 2 second gap between exposures), so averaging the brightness of the NEO over a period of about 24 seconds. The rapid fading is very evident and on the last frame there is only the hint that the object has been recorded at all. 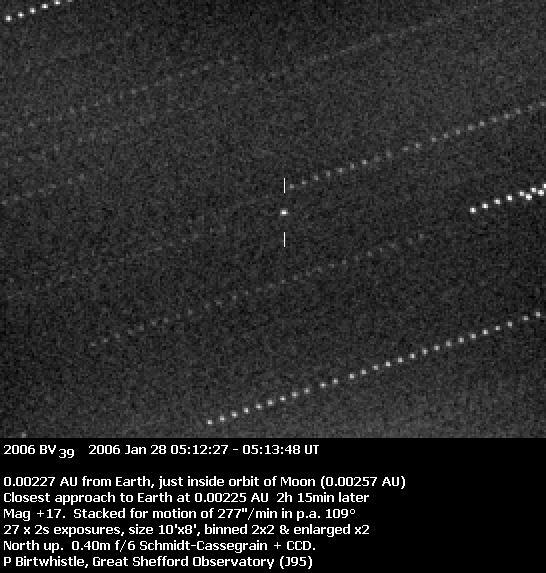 2006 BV39 was 0.00227 AU from Earth (or 0.88 lunar distances) when the images for this animation were taken., each frame has been enlarged x2 and is a stack of 9 x 1 second exposures using the 0.40-m Schmidt-Cassegrain and CCD. The field of view is 4' x 4'.